Our diamond look cubic zirconia Ziamonds by the Yard Station Bracelet features five 4mm .25 carat stones individually set in a thin wire bezel. 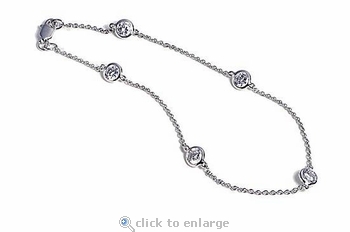 Nicely spaced apart, each stone is individually set with an exposed culet and pavilion allowing for the diamond look stones to seem like they are floating within the line of the chain. You can wear this as a stackable bracelet along with other wrist wear that you love, you can wear it with your watch as an accent piece, you can even have this as an ankle bracelet. 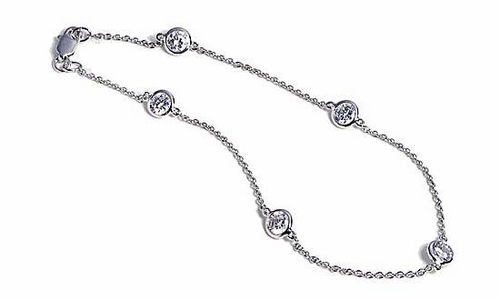 This dainty yet classic looking station bracelet makes a great gift and companion to our diamond look cubic zirconia Ziamonds By The Yard Necklace. Available in a bracelet length of 7 inches and an anklet length of 9 inches via special order. Please see below for length options. If you need a custom length that you do not see, simply call us for quote or engage one of our cubic zirconia jewelry specialists with our Live Chat feature on our site for assistance.